The country's gross investment is projected to exceed its gross national savings in this fiscal year (FY), 2018-19, apparently due to rise in the public sector investment, according to the International Monetary Fund (IMF). The gross investment is projected to stand at 32.3 per cent of the gross domestic product (GDP), up by 2.3 percentage points than that of gross national savings. The picture came up in IMF country staff report prepared for 2018. The gross national savings, consisting of public national savings and private national savings, usually remain above gross investment, and it has been a trend of Bangladesh's economy for long. 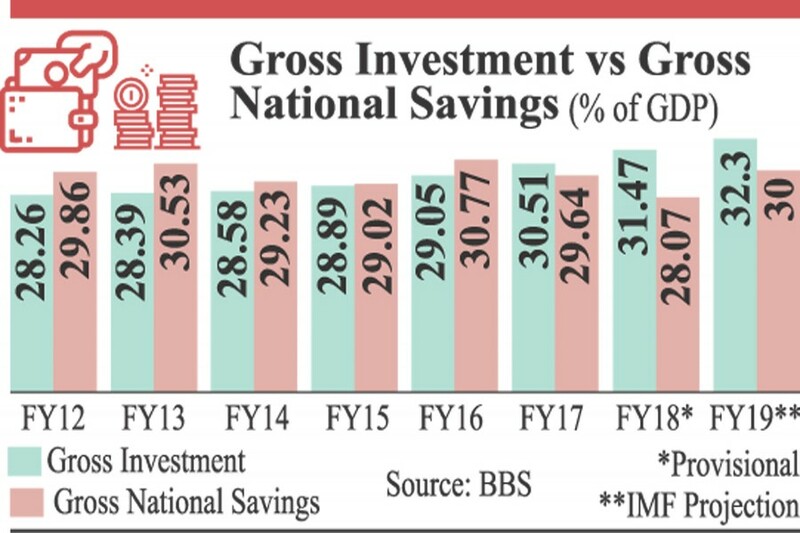 But the trend reversed, as gross investment stands above gross national savings, in the past two fiscal years - FY 2017 and FY 2018. There is a debate among the economists over the matter, as some believe that higher investment drives higher output for the economy, while others argue that savings should remain higher than gross investment. Chinese economy has always been maintaining higher savings than its gross investment, which is seen critically by many western economists. However, the economists said such rise in investment is widening the economy's current account deficit, as savings and investment are two important components of the current account equation. They told the FE that the present trend shows money is being siphoned off from the country instead of being invested here. The Bangladesh Bank recently told the reporters that a group of businesses are reported to have been involved in capital flight, amounting to Tk 40 billion in the guises of import and export. It also asked the tax authority to take necessary actions regarding the matter by probing it. Dr Zahid Hussain, lead economist at the World Bank (WB) Dhaka office, told the FE that savings should be higher than investment. But the reverse trend is seen in the country's economy for the past couple of years. "Do we see unusual investment situation in the country's economy over the past two years?" Dr Hussain hinted that many people are reportedly involved in capital flight. "Otherwise our historic trend could remain the same." On the other hand, Dr Ahsan H Mansur, executive director at the Policy Research Institute of Bangladesh (PRI), also told the FE that it is the reason behind the current account deficit. "We had current account deficit in FY 2017, and that year we also had higher gross investment over gross national savings," he said, by adding that the same happened in FY 2018 also. Dr Mansur opined that there is need for investigation whether or not fund is being siphoned off from the country. On the other hand, the Ministry of Finance officials said the government has been implementing many mega projects over the last few years, leading to the rise in investment from the public sector. He said Padma Multipurpose Bridge project and mega power projects, including Rooppur Nuclear Power Plant, are some of them. Public investment in terms of the GDP is estimated to be at 9.1 per cent in this FY. It was less than 7.0 per cent of the GDP even a few years back. On the other hand, private investment has been stagnant at around 23 per cent of the GDP for over the past few years. Private national savings have also been almost the same at over 27 per cent of the GDP for the past few years. Public national savings have been hovering around 2.3 per cent. Savings, investment and net export of goods and services are components of the current account balance, which is likely to be negative at 2.3 per cent of the GDP this FY.